I’ve been working on a local anthology and part of the pleasure has been the reading that has to be done to source our material. 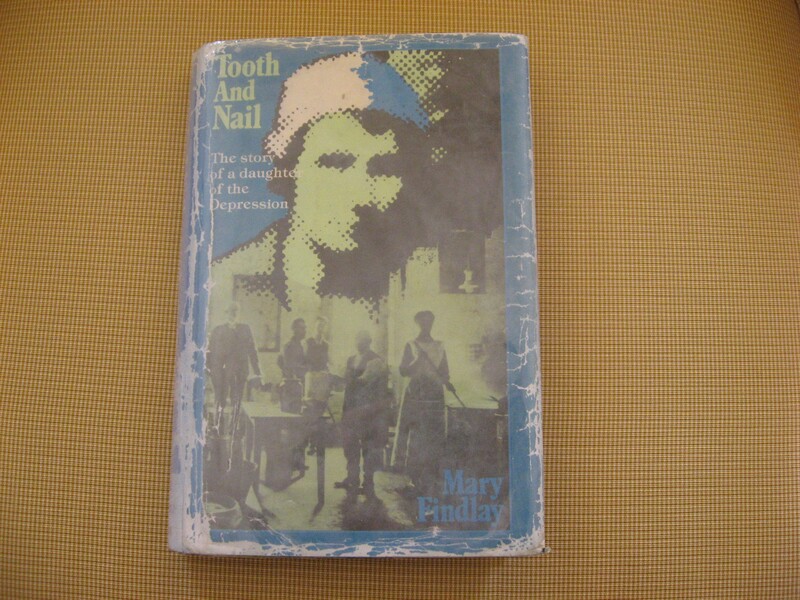 It was my good fortune to be directed by the Eastbourne Historical Society to a New Zealand novel ‘Tooth and Nail’ first published by A.H. and A. W. Reed, in 1974. At first I simply began skimming the book to find the piece I’d been alerted to, which is a very small piece about the author working as a cook-general in Lowry Bay. It was brief and not that eventful, but while skimming to find this extract, I became absorbed in Mary Findlay’s story. I had never heard of her book or of Mary Findlay but now I want to shout to every young woman in New Zealand – read this! It is an extraordinary tale of a daughter of the depression. Her mother has died, and her father is an abusive alcoholic. The period the story covers is really quite a small part of her life, but one of the most formative times in a young girl’s life, her early and ongoing teenage years. Her courage, tenacity and lack of self-pity are quite remarkable. The challenges she overcomes, the deprivation, the knock-backs (there are so many) and the opportunities that she seizes by the throat (indeed, tooth and nail), are riveting to read about and also a fascinating insight to New Zealand social history. Mary Findlay is blessed with real intelligence and the ability to see through the rigid conservatism of the times, allowing her to challenge it constantly albeit to her own detriment. The escapades, the adventure, the sheer grind of her life are both astonishing and uplifting. She manages to have enormous insight into her own character and doesn’t paint herself as other than how it really is, with all her flaws given equal space alongside her extraordinary courage. Unpopular at school because she is grubby and wears patched bloomers, Mary Findlay gets her revenge on her fellow students in a school assignment that requires the class to write portraits of other students. No-one, (especially the teacher who asks Mary to read hers aloud), expected such devastating accuracy and honesty in these portraits. Even knowing that she shouldn’t write them, Mary is compelled to do so, and it is this particular aspect of her character that carries the story forward, her determination and often bloody-mindedness, which I admired and envied. The writing is sometimes uneven but the subject matter is so compelling that it hardly matters and too, at times, there are hints of Robin Hyde and moments of extraordinary lucidity and powerful observations of both her own and the nature of other people. I’ve decided that this should be a Kiwi Classic (revival) like ‘Sydney Upside Down Bridge’ by David Ballantyne (although I’ve not yet read this novel) – but I am sure that every high school in New Zealand ought to have this story as part of their curriculum. It bears witness to a time in history when jobs were scarce, times were tough and there were no safety nets, and social conventions were very much stacked against a girl from the wrong side of the tracks. I was so happy for the author when I read this – glad to know that she found lasting love, because after all she had been through, her courage and tenacity, she sure deserved that. Perhaps many of you have already read this autobiography and if so, do drop by to tell me – but if you haven’t, I highly recommend that you do. It’s one of those books, I couldn’t put down and to be honest, lately, that doesn’t happen so very often. I worked in the public service in the late sixties and early seventies, and Mary Findlay’s experiences in the public service a couple of decades earlier, reminded me of the hierarchy, the sometimes futility of the work undertaken and the part that as girls, we had to ‘play’ within the conventions. It set me thinking about how fortunate we have been to have courageous small publishing houses such as Cape Catley to ensure that ‘our’ stories are told. And makes me proud to be working on an anthology of Eastbourne writing to be published by Makaro Press a new publishing venture by Mary McCallum.